The Acer H7850 is currently Acer's lowest-price 4K UHD home theater projector, at $1999 most places and (at the moment) $1699.99 on Amazon. This projector uses the 0.66" 4K UHD DLP chip and an RGBCY color wheel. In addition to 3840x2160 resolution, it offers HDR and a rated 1,000,000:1 contrast ratio. Moreover, it is ISF certified, so if you get it calibrated by an ISF technician, the choices for color modes will include ISF Day and ISF Night. For SDR material, the H7850 delivers appropriately fine detail for the resolution, color well within a realistic-looking range, dark blacks, and excellent contrast and three dimensionality. With HDR material it loses enough shadow detail in dark scenes to notice, but still delivers a compelling picture. Setup conveniences include the 1.6x zoom lens and vertical lens shift for placement flexibility. In addition, it is only 11.7 lbs., which makes the H7850 lighter and easier to handle than many 4K UHD projectors. Another key strength is that the H7850 is bright enough to fill very large screens. Even with optimized settings for video, it can light up a 190" 1.3-gain screen in a dark room. For brighter rooms or larger screens, it can deliver a quite usable image with enough brightness to boost the screen size to as much as 220" in a dark room or 140" with moderate light. Warranty is only 1 year for the projector; 90 days for the lamp. Low Lamp Mode. Eco mode reduces brightness by about 33% compared with full power mode. The specs also mention ExtremeEco, which isn't an Eco setting, but a power saving feature. 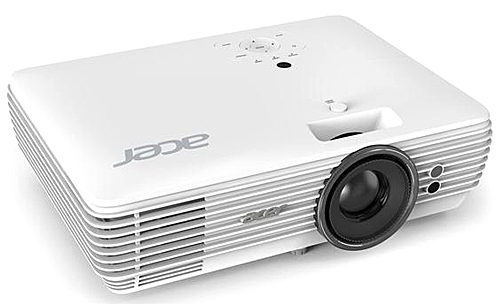 According to Acer, if the projector doesn't detect a signal, it will shift to Eco lamp mode. Zoom Lens Light Loss. The 1.6x zoom lens drops brightness by 23% in the full telephoto setting. That's not unusual for this level of zoom, but it is enough to notice. For maximum brightness, you'll want to position the H7850 as close to the screen as possible for the screen size. Video Optimized Lumens (SDR). Movie mode with some slight tweaking gives the closest color match to our reference projector and no loss of brightness. Even with default settings, colors are nicely saturated and well within the realm of realistic; they are slightly blue shifted compared to a reference projector, but not enough to be noticeable. The H7850 also delivers good shadow detail as well as excellent contrast, three dimensionality, and black levels. Compared with the Optoma UHD60, for example, its black is ever so slightly darker, but by so little that the difference shows only in a side-by-side comparison. In a dark room, the measured 1360 lumens with video optimized settings can give you a bigger picture than you might have room for. It is enough to light up a 1.3-gain 190" screen, or a 1.0-gain 170" screen. Switching to Eco power mode, at 915 ANSI lumens, drops the sizes to 155" and 135", and also lets you move to Normal power mode as the lamp ages and loses brightness. For rooms with ambient light, the brightness in Normal power mode with video optimized settings is enough for a 1.3-gain 120" screen. For higher ambient light levels or larger screens, you'll need to use a brighter color preset mode. Color Preset Mode Performance. The H7850 delivers realistic-enough looking color and good enough contrast in most modes to be highly watchable even with default settings. As with many projectors, the exception is its brightest mode, which has an obvious yellowish-green bias. If you need the extra brightness however--to stand up to bright sunlight in a family room for example--you may be willing to use it on an occasional basis. Standard, the second brightest mode, has a slight blue shift, which most people find more acceptable than a green shift. In this case, the colors are well within the realm of realistic looking. However, Standard mode has lower contrast than Movie mode and appears slightly less three dimensional. Dark Cinema delivers a close color match to Movie mode, but with a different gamma setting that improves shadow detail separation just a touch, while lowering contrast in most scenes that aren't dark enough for shadow detail to matter. Game mode and Sports mode are similar to Dark Cinema, but with higher brightness. Silent mode is similar to Movie mode for color, but somewhat brighter with its one power setting than Movie mode with Eco On. Video Performance. The H7850 delivers solid video performance for the price. In addition to realistic color, dark blacks, and excellent contrast and three dimensionality with SDR input, it delivers appropriately fine detail for both native UHD and upscaled 1080p input. For even crisper images, it offers both Super Resolution and Sharpness settings that you can adjust to taste. If you crank them up too high, however, they will make minor skin imperfections look like a nasty rash. Video processing options also include AcuMotion--Acer's name for frame interpolation (FI)--with four settings, including Off. Even level 1 smooths motion almost entirely and removes judder from camera pans, but it also adds a noticeable digital video effect to film. If you find that bothersome, you might want to use it only for live and recorded video, including sports, where you're much more likely to consider it an enhancement. Like most DLP projectors, the H7850 shows occasional rainbow artifacts. In my tests, the only times I saw them often enough to be bothersome were in test clips chosen specifically because they tend to show rainbow artifacts. Unless you're particularly sensitive to them, they shouldn't be an issue. HDR Performance. The H7850 offers four HDR settings. Level 1 is closest to the spec, but far too dark--losing most shadow detail in dark scenes. Level 4 is the brightest and most watchable. For optimal viewing, I started with Level 4, changed the gamma setting, and adjusted color to remove a noticeably green bias. After the changes, the H7850 delivered a compelling image. The more important limitation for HDR with the H7850 is that it offers only one User mode, and any changes you make to the factory default settings in any preset color mode immediately get saved in User mode, and erase whatever was there before. So you are required to use the factory default settings for all color preset modes and reserve User mode for HDR, unless you want to recalibrate your preferred custom settings every time you switch between HDR and SDR. It is simply more work than you should have to do. Brightness uniformity. The H7850's brightness uniformity is 53% at the wide-angle end of the lens and 63% at the telephoto end, which is unexpectedly low for a home theater projector in this price range. With a solid white image, it is obviously brighter in the center than the sides and brighter at the bottom than the top. With film or video, the difference is much harder to see. Depending on how much low uniformity bothers you, you may consider this unacceptable at this price or may never notice it. On-board audio. 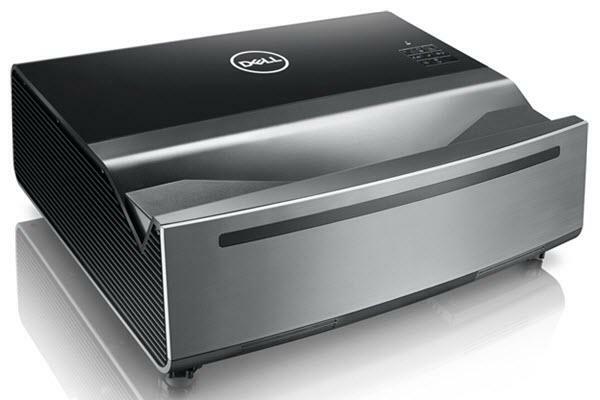 Home theater projectors are normally used with external sound systems. But if you need the H7850's onboard audio, the two 5-watt stereo speakers deliver good sound quality and enough volume to fill a small room. Fan noise. Acer rates the H7850 at 26 dB in full power mode, 24 dB in Eco mode, and 19 dB with the Silent color preset. In quiet moments, you can hear the fan in both full power and Eco modes from anywhere in a mid-size room as a steady white noise. Both have a high-pitched overtone that makes them more noticeable than they otherwise would be, but Eco mode is quiet enough that it shouldn't bother most users. Silent mode eliminates the high-pitch component entirely and is quieter still, making it hard to hear from more than a foot or two away. Acer recommends using High Altitude mode at 5,249 feet and above. If you plan to run in full lamp mode at High Altitude you may want to consider setting the projector up with some sound deadening material around it. Input lag. The 77 to 80 ms input lag with FI off, and the even slower 145 ms with it on, makes the H7850 a poor choice for serious gamers. More casual users may find it adequate with FI off. The H7850 also works with Acer's optional Wi-Fi Dongle and Wireless FHD kit, but they both support resolutions of only 1080p. Throw Distance. The H7850's throw distance for a 120" 16:9 image ranges from about 12'2" to 19'4". To find the throw distance range for the image size you want, see the Acer H7850 Projection Calculator. Lens offset. With the H7850 set up on a table, the lens shift allows the bottom edge of the image to be anywhere from even with the centerline of the lens to as much as 18% of the image height above the centerline. This range is ideal for setting up the projector on a low table or inverted in a ceiling mount. There is no keystone adjustment to square off the image, which means you should avoid any situation that forces you to tilt the projector up or down to hit the screen. This effectively rules out options like putting it on a high shelf behind the seats, which will usually force you to tilt it downward. When comparing the Acer H7850 and the Optoma UHD60, we find that each has some advantages over the other. Brightness uniformity. The UHD60 has better brightness uniformity, measuring 64% at the wide angle end and 74% at the telephoto end, compared with only 53% and 63% for the H7850. SDR Image Quality. For SDR input the two projectors are a nearly even match for almost every aspect of image quality, with suitably neutral color, excellent contrast and shadow detail separation, and dark blacks. The H7850's black is slightly darker, but by so little you can't see the difference without a side-by-side comparison. HDR Image Quality. For HDR input the UHD60 has a significant advantage for holding shadow details, showing details in dark scenes that get lost with the H7850. The H7850 also adds digital noise in some scenes and shows rainbow artifacts a bit more frequently than the UHD60--two issues that did not show up with SDR input. The biggest advantage for the UHD60 for HDR is that it lets you easily maintain separate settings for HDR and SDR input without the risk of overwriting your customizations. With the H7850, you can define User mode for HDR, but as soon as you, say, tweak Movie mode for better color accuracy, the tweaked version becomes the User mode and the HDR settings are gone. With the UHD60, you can customize each color preset mode individually, including HDR mode. Frame Interpolation. The H7850 has frame interpolation while the UHD60 does not. You can step up to the Optoma UHD65 at $2299 if you want this feature on the Optoma. We have not done a comparison of the relative quality of the two implementations of FI on these units. Input Lag. The UHD60 has a lag of 63 ms compared with 77 to 80 ms on the H7850. Zoom and Lens Shift. The UHD60 has a 1.56x zoom, almost identical to the 1.6x zoom on the H7850. They have nearly the same lens shifts and vertical offsets. Weight. The UHD60 is a bit larger, at 16 lbs. compared with 11.7 lbs. on the H7850. Fan Noise. Both are very quiet, but the H7850 is the quieter of the two, with both set to full power or Eco modes. The UHD60 also lacks an equivalent to the H7850's Silent mode which drops the fan noise even further. The Acer H7850 has a lot to like, with some limitations. Topping the list of strong points is its sharp, crisp 4K UHD resolution combined with color balance that's well within a realistic looking range--accurate enough that no calibration is required to get a thoroughly enjoyable image. For SDR input, it delivers solid blacks, separates shadow details well, and offers excellent contrast and three dimensionality. For HDR input, it loses some shadow detail separation and renders some shadows more solid black than it should, but it delivers a compelling picture otherwise. Other advantages include the 1.6x zoom lens, moderate vertical lens shift, and high enough brightness even with video optimized settings to fill up to a 190" 1.3-gain screen in a dark room or a 120" screen in moderate ambient light. So it is a good choice for both traditional home theaters and family rooms. It doesn't offer 3D support, but that's true of most current 4K UHD projectors. Serious gamers will balk at the 77-80 ms input lag, but all 4K UHD projectors we've seen so far are 50 ms or more. The real monkey wrench in the mix is that to get the image quality HDR promises, you have to adjust settings, and there's no easy way to store them for reuse. You either have to use factory defaults for the color preset modes for SDR and reserve the one User mode for HDR, or you have to change settings every time you switch between HDR and SDR. If you're not willing to do that, you'll be better off with a projector like the Optoma UHD60, which makes it a lot easier to switch between the two. If you don't mind following one of those two strategies, however, the Acer H7850 will give you a compelling picture for both SDR and HDR. Thanks for the review! Are there any plans for a review of the Acer V7850? A comparison Review H7850/V7850/uhd60 would be interesting, especially since there is a new firmware C13 which supposedly deals with the bad HDR and not being able to save settings. David, no immediate plans to look at the V7850, which appears to be a lower brightness/higher contrast version of the H7850 that likely differs only in the color wheel. It's something we'll consider for the future. Do you know which firmware version your demo projector was running? I've read that the early version 09 had problems that got resolved. Is there a way to assure that the latest update will be on the one I buy? Dave, no manufacturer can guarantee that the projector sample you purchase has the most up to date firmware because they have no way of knowing how long that unit might have sat in retail inventory. However, this is why most manufacturers allow you to update the firmware on your own as needed after purchase. I don't know what Acer's policy is here, but some investigation on their website or in the user manual (which is usually available for pdf download from our Feature Search/Database section for any model) will tell you if it can be done and how. It usually involves going online to download a new file to an otherwise clean flash drive, then following a specific procedure to boot the projector while the drive is plugged into the USB service port.